South Florida is going back to it rail roots. As a region, much of the development and growth in this area over the last century or so can be attributed to Henry Flagler and his Flagler East Coast (FEC) Railroad (and of course, Julia Tuttle who played no small role in attracting Flagler’s interest and investment). As development boomed and the era of the automobile emerged, Flagler’s railroad, which was never truly considered commuter rail, was overshadowed by huge investments in roadway and highway construction. Interstate 95, running almost in parallel to the FEC railroad in South Florida, became emblematic of how people moved and the railroad was seen as the transporter of freight. Today all of South Florida finds itself at an interesting crossroads. Through a combination of generational shifts, economic conditions, land scarcity, attention to environmental preservation and renewed interest in urban areas, much of the region is experiencing a change in perception particularly with regards to mobility. No longer is the private automobile seen as the only real choice for getting around. Much of South Florida is beginning to see that cars alone are not the ideal way to move people and planning for an auto-dominated city leads to a variety of urban and human ills. Such is the moment that All Aboard Florida has stepped into the role of regional transit provider. The conversation started, publicly at least, around 2012. All Aboard Florida, run by FECI, a sister company of the original FEC Railroad, has created rather large scale plans for Flagler’s rail line. The company is moving forward with the creation of train service between Miami and Orlando, with service expected to start in 2016. 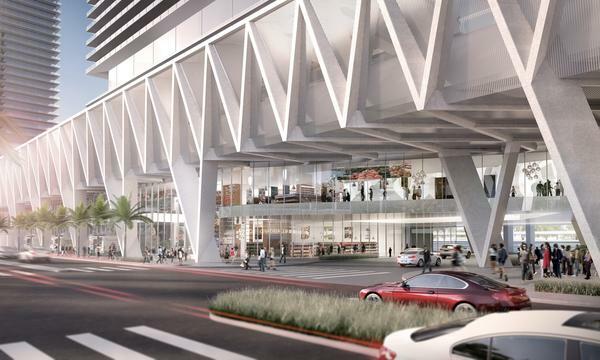 FECI isn’t just taking on rail service though; the company is planning a major mixed use development and train station on several downtown Miami blocks. Read more about their plans here. All Aboard Florida estimates that it will take 3 million cars off the road annually with its rail service that connects travelers between Miami and Orlando in about three hours and trim nearly an hour off of travel time between Miami and West Palm Beach. While this rail service will not provide local commuter rail, it may play an important part in establishing local service. The Tri-Rail Coastal Link project is pushing to add Tri-Rail service along the FEC line to run alongside All Aboard’s trains. While still in the planning stages, Tri-Rail Coastal Link would fill in the gap for local commuters between Jupiter and downtown Miami with the possible addition of about 28 new train stations between the two cities. Both projects could have an enormous impact on South Florida’s mobility, connectivity, economy, urban development and sustainability. Citizens for Improved Transit will be monitoring both projects and providing updates as available. Join our newsletter to stay informed.